The gorilla prefers planes, but a Chinese postwoman, hand-deliverying mail, has logged the kind of miles on foot that a businessperson might do on airlines. Luo Xiying, age 43, for 25 years has covered about 125,000 miles delivering mail to 20,000 people in the southern Jiangxi province of China. She alternates between a 40-km circuit on foot through steep mountains and a 70-km circuit that is partly doable by bike since a road was built in 2010. Accumulating typical 14 1/2 hour days, she earns only about $160-170 USD per month. Source: Daily Telegraph, July 26, 2012. A top traveler, but underpaid. As reported by multiple news services and the AP in January, police in Wisconsin arrested Beezow Doo-Doo Zopittybop-Bop-Bop. His former name had been Jeffrey Drew Wilschke. He was arrested after complaints of excessive drinking and rugs at Reynolds Park, Madison, Wisconsin. Monkey traveling on goat: Per the Irish Examiner (January 9, 2012), a circus monkey was caught stealing vegetables from a local farmer in China. He would ride on the back of a goat and stand up to see if the coast is clear. Here's another trip: Police in Steamboat Springs, Colorado, were called to investigate a "suspicous-looking item" that was seen in a resident's backyard. Per the Sunday Times (March 11, 2012), police determined it was a potato. The "Cardiff kook" is a statue of a surfer located on Route 101 in Cardiff, California. It is near the San Elijo State Beach campground. The commissioned sculpture, paid for by the Cardiff Botanical Society several years ago, perplexed the local surfing community, which is big, since the surfer's pose is unrealistic or indicative of an unskilled rider (a "stink bug" stance) and the surfer is not very macho. However, quite frequently, local groups under the cover of night will dress the kook up in all sorts of clothing and even scenery backdrops, such as a giant pterodactyl set up to be in the process of grabbing the kook off his board. He has also been fixed up to appear in the process of being eaten by a shark. There has even been a kook calendar for sale since late 2011 for the year 2012. Phil Newton, age 30, was surprised to see a double-decker bus driven down the street in Darwin, Australia. Oh my. He chased the vehicle down, jumped through a window to enter the bus, and jammed on the handbrake. This was in the nick of time, since the bus was about to hit a parked. car. The dogs owner, Richard McCormack, age 62, uses the bus mainly for a mobile home. He had stepped out for a moment, when his two-year-old German koolie dog, Woodley, released the hand brake and started the bus moving forward. Brought to you from the United Press International, Nocember 20, 2011. Chocoholics at the London Aquarium? As reported by UPI this past August, "Gary," a fish of the gourami species weighing 8.8 pounds, has been gradually weaned off Kit Kat bars. "I have never heard of a fish being fed chocolate, let alone being brought up entirely on the stuff," handler Rebecca Carter said. "Gouramis usually eat a diet of fruit but Gary doesn't appear to have suffered any ill effects from his chocolate addiction." The fish had been donated to the aquarium by its former owner, who had only fed the fish Kit Kat chocolate wafer pieces. Travel to London to see the aquarium. Book flights on AirGorilla.com to international travel destinations and for domestic trips as well. Perhaps extraterrestrials are "living abroad" in Serbia these days? In the 2011 census Serbia included a new section where extraterrestrials can indicate their identities. This makes some readers remember that in 2001, about 390,000 people in the Census for England and Wales listed their religion as "Jedi." They were merged with atheists by the Office of National Statistics. Message to our readers: Take flight with AirGorilla.com. We don't fly to the stars (yet), but we offer trips on 100's of worldwide airlines at great rates. It seems he was a giant fraud. One of his first travel books was "Description of the World." This was based on alleged journeys as a trader from 1271 to 1295. The volume was supposedly produced with the help of romance writer Rustichello during their imprisonment together. No one even knows why they were in jail. In the 1995 book, "Did Marco Polo Go To China? ", Frances Wood argues that Marco Polo never traveled further than the Black Sea, which is North of Turkey and East of Romania. Polo fails to mention the Chinese drinking tea, their use of chopsticks, foot-binding traditions, or the Great Wall of China. Nothing in archives in Venice indicates he traveled to China whatsoever. Very little of Polo's writing explicitly said things in the first-person, as if he had seen something himself. Recently, Italian archaeologists laboring in Japan have cast additional doubt. As noted by the Daily Telegraph and paraphrased thusly by the Fortean Times, "They point in particular to inconsistencies in his description of Kublai Khan's attempted invasions of Japan in 1274 and 1281. 'He confuses the two, mixing up details about the first expedition with those of the second,' Professor Daniele Petrella of the University of Naples ... told Italian history magazine Focus Storia.'" Could an eyewitness really confuse major details, such as the typhoon, between two acounts? 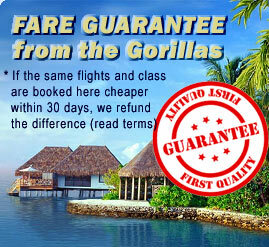 Message from our site: Book airline tickets with AirGorilla. Use deals on international airfare and hotels for you today. The gorilla had to travel into his archives to find this story. Per Western Mail, May 19, 1994, two men were convicted of trying to smuggle endangered primates. The smugglers were trying to load a gorilla and an orang-utan for a trip to Mexico. However, the "gorilla" turned out to be a federal agent in a gorilla costume! (via Fortean Times 280, November 2011). In the savannas of Zambia, there is an elephant who's really smart. Perhaps this guy saw a giraffe in Zambia and realized then that a long reach could pay great dividends. Most elephants shake trees to get tasty pods to fall down. But this fella reaches up with his trunk. At the time of the photograph, he was about 40 years old, and years sometimes bring wisdom as we humans have known. The photographer and Old Mondoro Bush camp manager reported, "The vegetation is mostly tall trees and short grass bushes. Most of these trees in our area have pods on them and the elephants mostly shake the tree to get at these pods." Oddly, the rest of his herd does not seem as bright, as he is the only one to use this technique. However, perhaps this will change, as the manager reported, "'There are also a group of younger elephants that follow this guy around to get at any scraps he may leave, they are still to young or small to be able to reach the pods." This story happily brought to you by our traveling gorillas scouring the web for interesting bananas, err, bits of information that you airline travelers may find interesting.